First Aid is not just for the Aquatic environment but for everyday life. Many jobs ask for their employees to attain the Standard First Aid and CPR “C” training to know that their staff are adequately prepared in case of an accident or emergency were to occur. These classes are all dry and take place in our classroom in unit #10. The Swim Academy offers a wide variety of courses from Standard First Aid to Babysitting Courses to make sure our clients are safe and well equipped. You don’t have time to take a full course? Try one of our workshops that will teach you the basics of what you need to know for most first aid situations that occur in the home. What to do if your child has a tumble, a toddler chokes on a marble, an elder in the home has a stroke, or a parent spills boiling water on themselves. These workshops will help you have the tools needed to limit the damage and safely learn how to manage pain before you can see an emergency specialist. You don’t see a course offered? Feel free to call us at (905) 339-3000 and we would be happy to speak with you further about the various options. Providing comprehensive training covering all aspects of first aid and CPR. A more in-depth understanding of first aid including: legal implications of first aid treatment, spinal injuries, heat or cold injuries, bone and joint injuries, chest injuries, and medical emergencies. Includes CPR-C certification. 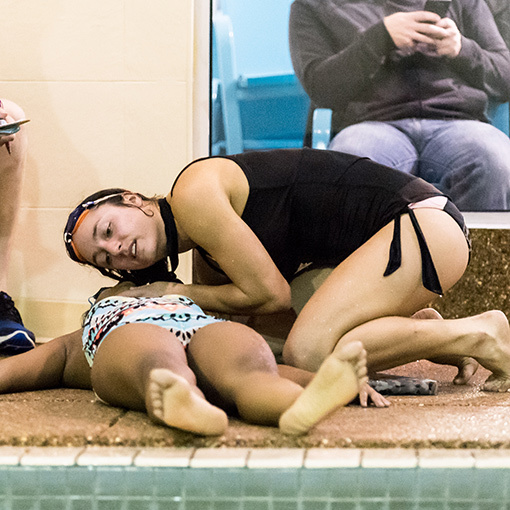 The first aid program is not restricted to aquatic candidates. You can use the Lifesaving Society’s first aid awards to train non-aquatic staff (camp, playground, maintenance, etc.) and the general public. Every 2 years you need to recertify your Standard First Aid to make sure you know all of the up to date guidelines from the most current research. This is a non certificate course put together as a short workshop covering the basic first aid skills you may need in everyday use. Gearing towards homes with young families to make sure you know what to do in case of an emergency. This course is designed for the 9 and 10 year old group by the Canadian Safety Council, to help prepare them to deal with unforeseen emergencies and staying safe in times where they may find themselves alone for short periods of time. Participants will learn how to deal with phone calls and visitors, recognize hazards and follow home safety procedures. They will also learn first aid basics, healthy eating, fire safety and how and when to use 911. Developed by a team of child care professionals, trained babysitters, St. John Ambulance instructors, and parents this course teaches new babysitters the skills necessary to care for infants, toddlers and pre-schoolers. It emphasizes safety, dealing with emergencies and first aid basics. Course materials include; a student activity book, a certificate suitable for framing, and a wallet-size certificate. Does your group or company need Standard First Aid? Whether it be for groups ( Girl Guides, Scouts etc.) or companies ( teachers, day care, factory, etc.) let us come to you and fully train your staff in their First Aid training. We will use practice scenarios that apply specifically to you. Providing comprehensive training covering all aspects of first aid and CPR. A more in-depth understanding of first aid including: legal implications of first aid treatment, spinal injuries, heat or cold injuries, bone and joint injuries, chest injuries, and medical emergencies. Includes CPR-C certification. This course is a 2 day course, we will provide all equipment necessary.